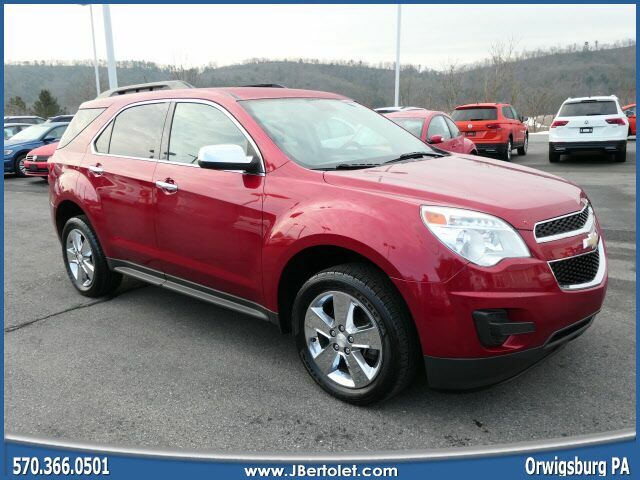 Treat yourself to this 2013 Chevrolet Equinox LT, which features a remote starter, backup camera, hill start assist, stability control, traction control, Sirius satellite radio, AM/FM radio and CD player, anti-lock brakes, dual airbags, and side air bag system. This one's on the market for $13,900. With only one previous owner, this vehicle's a catch! Drive away with an impeccable 4-star crash test rating and prepare yourself for any situation. Rocking a classic red exterior and a jet black interior, this car is a great pick. Music-lovers won't want to get off the road with great audio features AM/FM radio and CD player. Make your move before it's too late schedule a test drive today! Contact Information: J Bertolet Volkswagen, 555 Rt 61, Orwigsburg, PA, 17961, Phone: (570) 366-0501, E-mail: johnbertolet@jbertolet.com.